Some teeth have cracks that are too small to show up on X-rays. Sometimes the cracks are under the gum. These small cracks are known as "cracked tooth syndrome." Cracked tooth syndrome is most common in lower back teeth (molars). That's because these teeth absorb most of the forces of chewing. Some people grind or clench their teeth. These people may be more likely to have cracked tooth syndrome. Sometimes, the way a person's teeth come together can put too much pressure on one tooth. This can cause the teeth to crack. Teeth with large fillings may be more likely to crack. Teeth that have undergone root canal treatment are weaker than other teeth and also may be more likely to crack. People with one cracked tooth are more likely to have others, either at the same time or in the future. The tooth may hurt sometimes when you bite or chew. The sensitivity or pain can be mild or intense. It may be painful only when you eat certain foods or when you bite in a specific way. You will not feel a constant ache, as you would if you had a cavity or abscess. The tooth may be more sensitive to cold temperatures. If the crack gets bigger, a piece of the tooth can break. You many also develop an infection. This can happen in the gum around the fractured tooth. You may notice a pimple-like bump on the gum near the tooth. This is known as a fistula. Many people with cracked tooth syndrome have symptoms for months. It is hard to diagnose cracked tooth syndrome because the pain is not predictable. Your dentist will examine your mouth and teeth, focusing on the tooth in question. He or she may use a sharp instrument called an explorer to feel for cracks in the tooth. Your dentist also will look at the gums around the tooth. You may have X-rays taken. But X-rays often do not show the crack. Your dentist may use a special tool to test the tooth. There are different kinds of tools. One looks like a toothbrush without bristles. It fits over one part of the tooth at a time as you bite down. If you feel pain, the part of the tooth being tested most likely has a crack in it. Your dentist may shine a very bright light on the tooth. He or she may stain it with a special dye. If the tooth already has a filling or crown, your dentist may remove it in order to see the tooth better. How long symptoms last depends on how quickly a cracked tooth can be diagnosed. Even after a crack is found, treatment may not completely relieve the symptoms. Treatments for cracked tooth syndrome do not always relieve the symptoms. Sometimes a crack affects one or more cusps of a tooth. These are the highest points of the tooth. 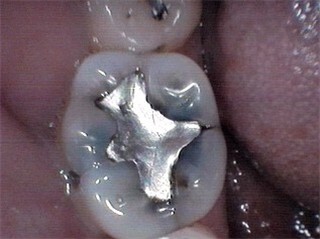 In this case, the tooth may be fixed with a crown. Some cracks affect the pulp: the center of the tooth, where the nerves and blood vessels are. In that case, the tooth will need root canal treatment. About 20% of teeth with cracked tooth syndrome will need root canals. After a root canal, the tooth will no longer be sensitive to temperature, but it still will respond to pressure. If you felt pain before the root canal, you may still feel some pain afterward. It probably will not be as intense or as frequent, but it may still occur. In some cases, the tooth may need to be removed. Some cracks affect the root of the tooth in the jaw. There's no way to fix this type of crack. If your tooth is removed, you can have it replaced with an implant or a bridge. Your dentist can make a night guard (a plastic bite piece) to prevent you from grinding your teeth. This will relieve the pain from grinding. For some people it can stop tooth sensitivity. The night guard can be worn during sleep. It also can be work at other times if clenching or grinding happens during waking hours as well. If you feel pain when you bite or chew, contact your dental office. Treatment of cracked tooth syndrome is not always successful. Your dentist should talk with you about what might happen. In some people, a crown will fix the problem. In others, root canal treatment solves the problem. Some people continue to have occasional symptoms after treatment. They may need to have the tooth taken out.